Optic neuritis is inflammation of the optic nerve. The optic nerve connects your eye to your brain, and is therefore an essential part of your visual pathway. Without it, you will not be able to see. The optic nerve is composed of over one million nerve fibers. It transmits signals from the retina to the brain, so that your brain can interpret what it is that you are seeing. Any damage to the optic nerve, including from optic neuritis, can therefore affect your vision. Diagram demonstrating the location of the optic nerve. Optic neuritis typically affects young female adults aged 20 to 40. However, it can occur at any age, including in children and in the elderly. It is not a common condition. It affects around 1 out of every 1000 people. Women are nearly twice as likely as men to develop this condition. WHAT ARE THE SYMPTOMS OF OPTIC NEURITIS? Most of the symptoms of optic neuritis are due to the inflammation affecting the function of the optic nerve. The most common symptom is reduced visual acuity in one eye, although sometimes both eyes may be affected. The reduced vision can range from a small patch of blurred vision to near total blindness. The blurriness can be worsened by exercise (Uhthoff's phenomenon) or heat. You may also notice that your vision is more washed out or less vivid than normal. This is due to reduced color vision and loss of contrast. The reduced vision typically develops over a course of 1 day to 2 weeks. After 2 weeks, your vision should gradually improve over the next 6 to 12 weeks. In some, recovery can take several months. In others, there may be permanent loss of vision. An example of how your vision may be affected if you have optic neuritis (left). Notice how the image appears more blurry and faded compared to normal (right). Pain on eye movement is also a typical feature of optic nerve inflammation. It tends to peak within the first week and lessens thereafter. The sensation of pain is caused by irritation of an already inflamed optic nerve due to pulling and tugging by the extraocular muscles. This is a very useful feature to distinguish optic neuritis from other causes of optic nerve disease. WHAT ARE THE TYPES OF OPTIC NEURITIS? Optic neuritis is generally classified according to the part of the optic nerve that is affected. The symptoms and treatment are generally the same regardless. Retrobulbar neuritis: In retrobulbar neuritis, the optic nerve is inflamed at a location behind the eyeball without affecting the optic disc. The optic disc is the part of the optic nerve that inserts into the eyeball and can therefore be seen on clinical examination. Typically, with retrobulbar neuritis, your ophthalmologist will not be able to detect any clinical abnormality on viewing the back of the eye. Papillitis: In papillitis, the inflammation also affects the optic disc. This is seen clinically as swelling of the optic disc. Neuroretinitis: In neuroretinitis, there is also involvement of the retina. This is seen clinically as a macular star (yellow exudates around the macular). WHAT ARE THE CAUSES OF OPTIC NEURITIS? There are quite a number of conditions that can cause optic neuritis. The most important cause is demyelination. However, inflammation of the optic nerve can also be the result of infection, diabetes and uveitis. Demyelination: Demyelination refers to the destruction of the myelin sheath that protects the optic nerve. When the myelin sheath is no longer present, the optic nerve is unable to work as well as it normally should. There are 2 main demyelinating diseases that cause demyelinating optic nerve inflammation: multiple sclerosis and neuromyelitis optica (Devic's disease). Multiple sclerosis is a demyelinating disease that affects the central nervous system. Symptoms can vary from double vision, numbness and tingling to paralysis and loss of cognitive function. In around 15% of those who eventually develop multiple sclerosis, optic neuritis is the first symptom. The risk of develping multiple sclerosis is around 50% within 15 years of the first episode of optic nerve inflammation. Up to 70% of those with multiple sclerosis will develop optic nerve demyelination at some stage of their disease. Multiple sclerosis can be investigated with MRI (magnetic resonance imaging) scanning of the head, as well as lumbar puncture. One of the investigations that can be performed for optic neuritis is MRI scanning of the orbits and head. A gadolinium-enhanced fat-saturated T1-weighted scan will show a bright enhancement of the inflamed optic nerve (upper left red arrow). 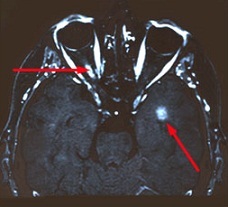 Additionally, bright spots characteristic of multiple sclerosis may also be seen in the brain (lower right red arrow). Neuromyelitis optica (Devic's disease) is also a demyelinating condition which generally tends to affect the spinal cord. It causes more severe optic nerve inflammation and neurological problems when compared to multiple sclerosis. Please note that having a diagnosis of optic neuritis does NOT necessarily mean that you will definitely develop multiple sclerosis or neuromyelitis optica in the future. It just means that you have a higher risk compared to others. Infection: Various infections from bacteria and viruses can cause optic nerve inflammation and damage. Bacterial infections include tuberculosis, toxoplasmosis, syphilis and Lyme disease. Viral infections include herpes zoster and HIV. Sometimes the infection can spread to the optic nerve from pre-existing meningitis or sinusitis. Diabetes: Diabetes is a chronic metabolic disorder, whereby either the body does not produce enough insulin or the insulin that is being produced does not work properly. If you have diabetes, your vision can be affected from diabetic retinopathy as well as from papillitis. Uveitis: Uveitis is inflammation of the uveal tissue (iris, ciliary body and choroid). Sometimes, the inflammation can be so severe as to also result in papillitis. 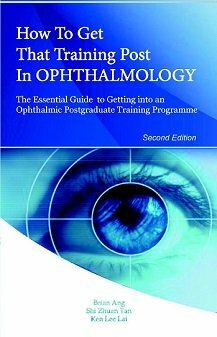 Uveitis with optic nerve involvement is considered to be sight-threatening. 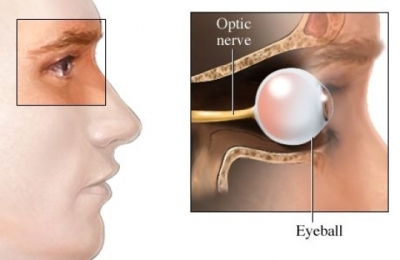 HOW IS OPTIC NEURITIS TREATED? Treatment for the optic nerve inflammation will depend on the underlying cause. If the inflammation is related to infection, diabetes or uveitis, then these underlying conditions will need to be treated accordingly. In most cases of demyelinating optic nerve inflammation, no treatment is required. The inflammation will resolve by itself and your vision will slowly recover and improve over 6 to 12 weeks. 95% will recover most of the vision within 6 months. You will likely have some residual visual deficit, which may or may not be noticeable to you. Unfortunately, recurrence in the same eye will occur in around 20% of the time. You also have a 15% chance of the inflammation occurring in the other eye within 10 years. If you have multiple recurrences, you are likely to experience some degree of long-term vision loss. In some instances, treatment with systemic corticosteroid may be indicated. Intravenous methylprednisolone followed by oral prednisone has been found to hasten the recovery process, but there was no effect on the long-term visual outcome. Corticosteroids should only be used after careful consideration due to their wide range of side effects including high blood pressure, gastric ulcers, diabetes, infection, osteoporosis and mood swings. Furthermore, some research has suggested that oral corticosteroid may increase the risk of recurrences. If you are considered to be at higher risk of developing multiple sclerosis (2 or more brain lesions seen on MRI scanning), immunosuppresant medication may help to prevent or delay its onset. These medications are given as subcutaneous injections. They include interferon β-1a (Avonex, Rebif) and interferon β-1b (Betaseron). As with corticosteroids, they are also associated with a wide range of side effects, such as flu-like symptoms, depression, liver damage, reduced immunity and tissue damage at the site of injection.